Local marketing research firm Borrell Associates released a new report this week that confirms what most of us have seen firsthand in the past few years: Small- and medium-sized business owners are investing more time and money in digital media. 90% of participants have a web presence they invest in daily. 80% have an active social media presence. On average, participants spend more than 25% of their annual marketing budget on digital. 11% invested in mobile advertising in the past year. SMBs will spend an estimated $500 million on digital marketing in 2014. Why It Matters: As consumers are spending more and more time in the digital realm, business owners are shifting their marketing spend accordingly. But this transition hasn’t been painless. While many SMBs are investing more in online marketing campaigns, they’re often confused or uncertain about the best way to run these campaigns and which channels are best for their needs. It’s important that you invest the time upfront to learn about digital marketing tools so that you can use your budget wisely. Educating potential customers about your business is essential. It’s not enough just to have services that consumers want—you have to also convey your brand story in a compelling way that will make them choose you over one of your numerous competitors. Create a great About Us page. Add email marketing into your mix. Encourage happy customers to speak for you! Why It Matters: Advertising trends come and go, but the power of great storytelling will never fade. The important thing is that you put your story out there for prospects and customers to engage with, using a variety of media that will speak to different interests. Mobile marketing and advertising efforts are going to pay off more than ever during the 2014 holiday season, according to a new study from Deloitte. While mobile sales are projected to increase only 14% this year, over 50% of in-person sales are projected to be influenced by mobile activities. Another key stat: 84% of shoppers will be using digital tools before or during their trip to a physical location. That means that if you’re not providing digital tools to help consumers research the products and services your business offers, you’re missing out! Why It Matters: Many consumers still prefer to shop in person, especially around the holidays—but they’re relying on mobile tools more than ever to investigate gift purchases in advance. In order to help your local customers perform research ahead of time, make sure your website has the most up-to-date menu of products and services with detailed descriptions that will get them excited about what you have to offer. Additional mobile marketing and advertising efforts will help your business stay top-of-mind with current clients and reach new ones just in time for the holiday boom. Find out how cloud-based spa software and salon software can have a positive impact on your daily operations. 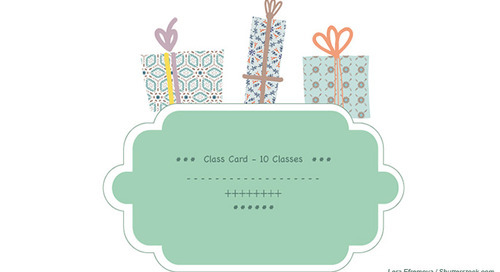 Sell more class cards and series for your yoga studio this holiday season.